Are you from Philippines and you want to make good profit having elementary IT skills? – There is a perfect way to get your money! GSM termination helps people to make money using elementary IT skills. 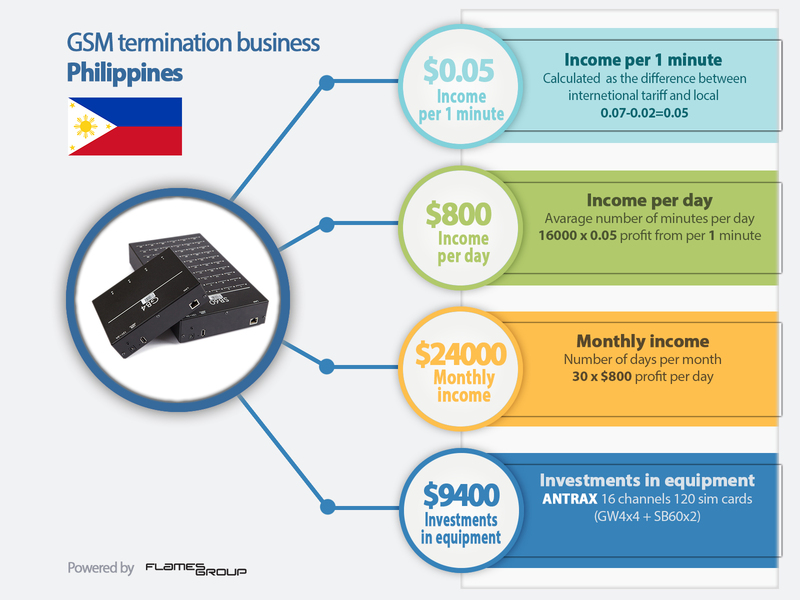 To start this business in Philippines you need a device (VoIP/GSM gateways) and traffic. Device converts international calls into local ones and VoIP signal into GSM. You play role of operator and get extremely high income. We are often addressed by potential clients from Asia who are interested in profitability of GSM termination in Philippines. That’s why we decided to share useful details for those who are looking for a new business opportunity and ready to invest with fast refund. If you are a successful businessman or employed, maybe you are a doctor or a teacher, or an experienced IT guy – in any case you have a chance to open new possibilities to make good money. It works pretty easy. You have to install everything and monitore system then you’ll get your money. You will be taught to control the system by our specialists. We are aimed at long-term relationship with our customers. Our customers are our friends. Manager will make the best offer to you and help in getting an individual configuration which will be the most suitable for your region. I must admit our managers are professionals with huge experience in this field, so you will get all necessary details and deeply developed business plan. What will you need to start business in Philippines? Mobile Smart is a Philippine telecommunications conglomerate with extensive operations in Asia. The best choice for VoIP GSM termination is tariff 0.02 USD per minute of call to any destination inside Philippines. Meanwhile your income will be 0.07 USD for every minute of successful call, transmited through the GSM termination system. All facts mentioned above mean that you have at least 0.05 USD of pure profit! Finally, it’s absolutely easy to find location in Philippines with stable Internet connection and electricity. Do you want to be successful and to raise yourself? – Please, contact one of our telecommunication experts and get personal consultation immediately!